What does Dwarka share with some of these well known landmark areas of Delhi – Parliament Street, CGO complex, North Block? Take a guess…Wide roads? Probably, but not quite! For those uninitiated ones, the above mentioned places are the seat of power and the hub of officialdom. And Dwarka too is getting into this league what with the numerous government and semi government offices and establishments setting themselves up here. Infact most offices have moved from cramped locations in Lutyens Delhi to spacious complexes that are now architectural landmarks of Dwarka. There are some of the leading government organizations and institutions. And the list is indeed impressive. Centre for Cultural Resources and Training ( CCRT )-The Centre for Cultural Resources and Training (CCRT) under the aegis of Ministry of Culture, Government of India is located at 15-A, Sector – 7, Dwarka. This has moved here from its earlier premises at Bahawalpur House, near Mandi House. CCRT has been instrumental in raising the awareness about India’s culture and heritage as well as bring to the limelight the talent and beauty of the country’s rural artisans and performers. The Dastkar Mela, regional film festival and summer camps are all innovative initiatives of CCRT to showcase and disseminate this mosaic of art and culture amongst children and adults. The CCRT Auditorium has proved a big hit and has become an important landmark in Dwarka for all cultural activities. “When CCRT was at Bahawalpur house near Mandi house we hardly went for these festivals and performances. Now my family enjoys at least one cultural event at CCRT every other month. Its location here is a great boon for the residents here,” says JD Seth, a local resident. National Highways Authority of India ( NHAI )-Undoubtedly, what has been singularly the most visible development around Delhi in general and Dwarka in particular is the opening of wide expressways and highways. Behind these roads that have eased traffic problems and snarls is the hardwork put in by National Highways Authority of India or NHAI, in short. NHAI which has its office at G5 & 6, Sector 10, is the nodal agency entrusted with the responsibility of implementing the National Highways Development Project (NHDP) on Government of India’s behalf. NHAI has an expansive and impressive building at Plot No-G-5 & G-6, Sector-10, which indeed is a landmark in literal terms. A part from the improvement, maintenance and augmentation of the existing National Highways network, NHAI is entrusted with the implementation of road safety measures and environmental management. Intellectual Property Rights (IPR)-From scattered, old, dingy premises a few years ago, the Intellectual Property Rights (IPR) Office building have now graduated to this modern integrated complex in Sector- 14. Dwarka. The Indian government felt the need to set up integrated IP offices, with patents, designs, trademarks and geographical indications all in one building, so as to increase the efficiency and availability of all IP related services. The special feature of the Delhi IPR Office is that not only patents, but trademarks, copyright and geographical indications are all housed here. This modern integrated building complex fulfills a long-felt need. Football House-Another feather in Dwarka’s cap is the Football House, the headoffice of the All India Football Federation (AIFF). The new ultra modern construction is located at Sector 19. AIFF has moved from Goa to Delhi. The building spanning an area of 2000 sq metre, is a 3-storeyed, state-of-the-art construction and houses the various departments including administration, coaching, competition, accounts and media. The building houses various departments including administration, coaching, competition, accounts and media. “The new structure has given a new identity to football itself and it is a pride for all football lovers to see this magnificent building. I cannot forget the memorable meeting with legend Bhaichung Bhutia who was here. The building and its environs are an inspiration for football lovers,” exclaims Devashish Basu, an enthusiast. District Courts-This is another important landmark of the subcity. Located at Sector 10, the move to establish a district court started with the decentralisation of District Courts and with different zones of Delhi having their own courts. The opening of district court meant saving on time and expenditure for lakhs of litigants from these parts, who traveled to the far away Patiala House complex near India Gate (for criminal cases) or Tiz Hazari court in North Delhi (for civil cases). The state-of-the-art complex comprising two eightstoried buildings housing 40 courts each is located in Dwarka’s Sector-10. Dwarka courts have perhaps positively affected and impacted the largest number of residents of the sub city. “We are indeed thankful for this decision. Else we had to go to Tis Hazari courts which meant an entire day spent in commuting, many a time without any result. Dwarka district courts have made things much convenient,” says Darshan Singh. Dwarka Police Stations-Dwarka being a large, spread out area, managing it requires people, adequate infrastructure and good planning. With a view to have better policing and in keeping with the growing needs and demands of the expanding sub city, the police have revamped the system. The DCP office has been shifted to Dwarka and is operating from Sector-19. Dwarka presently has three police stations. Besides the police station at Sector 23, a second Police Station was inaugurated at sector 16-B and another one at Sector-9. 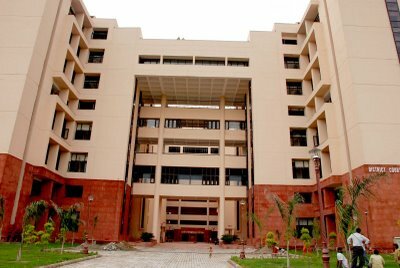 National Board Of Examination Office-The building located at Sector-9 oversees the entire gamut of examinations from undergraduate, post graduate and post doctoral examinations in our country. Besides there is Medical Council of India office situated in Sector-8. The MCI is vested with powers, duties and function of regulating the practice of Modern Scientific System of Medicine in the NCT of Delhi. There is also National Institute of Malaria Research office situated in Sector-8. The primary task of the Institute is to find short term as well as long term solutions to the problems of malaria through basic, applied and operational field research.